Oro Agri USA | High-performance HSMOC with TransPhloem Tech. ORO®-HSMOC provides improved emulsifying and superior translocation. Designed for use with foliar-applied, post-emergent herbicides, ORO®-HSMOC delivers faster translocation, faster absorption and better spreading and wetting for a dramatically superior level of weed killing performance. 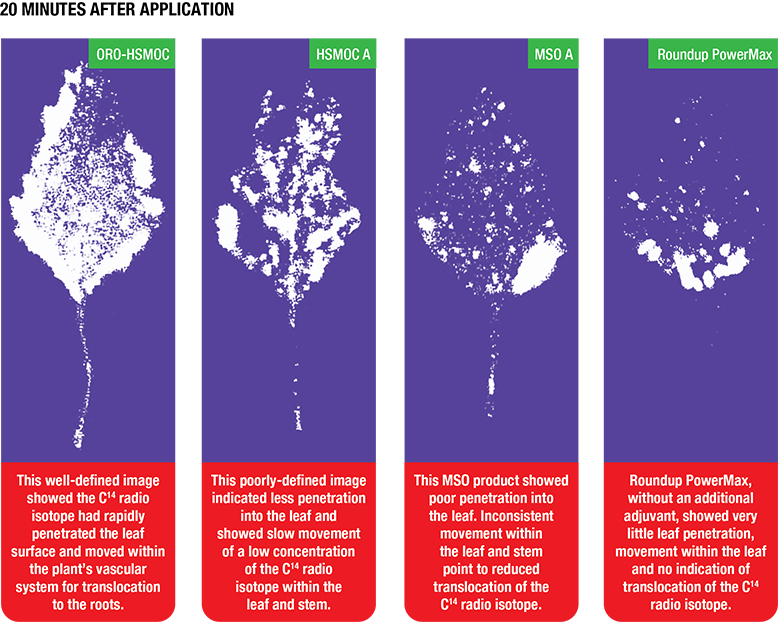 University research has proven ORO-HSMOC translocates more herbicide, more rapidly, to weeds’ roots than other widely used HSMOC and MSO products. This results in faster weed kill and less competition for moisture and nutrients for your crop. Most HSMOC/pesticide emulsion particles are too large, separate too quickly and do not spread well enough on the leaf surface to optimize the efficacy of post-emergent herbicides. ORO-HSMOC’s proprietary TransPhloemTM technology accelerates the movement of pesticide active ingredients into a plant’s phloem for translocation throughout the plant for superior results. BETTER SPREADING — ORO-HSMOC delivers the best spreading and wetting of any HSMOC product on the market. Uniform spreading of the spray solution reduces runoff, accelerates penetration, and improves pesticide performance. FASTER PENETRATION — Studies at the University of Illinois show ORO-HSMOC penetrates the leaf surface more rapidly and thoroughly than competitive HSMOC and MSO products. This means more herbicide is moved into the plant for translocation and, ultimately, better weed control. This rapid penetration also reduces herbicide loss through rainfall or other environmental factors. SMALLER PARTICLE SIZE — ORO-HSMOC, as a result of TransPhloemTM technology, produces a smaller particle size than competitive products when mixed with herbicides. This allows faster and more thorough translocation throughout the plant and a more stable solution in the spray tank. IMPROVED EMULSIFYING — ORO-HSMOC forms a stable emulsion with tank mix partners. This contributes to faster absorption and avoids any separation of the oil and water components of the spray droplet. Excellent emulsifying avoids the separation some other HSMOCs experience that can lead to inconsistent herbicide performance or phytotoxicity. SUPERIOR TRANSLOCATION — University research has proven ORO-HSMOC translocates more herbicide, more rapidly, to weeds’ roots than other widely used HSMOC or MSO adjuvants. University of Illinois studies clearly demonstrated ORO-HSMOC’s superior performance compared to other widely used HSMOC or MSO adjuvants. For more study results, download the Spray Guide at the bottom of this page. The owners of Dove Ag Services talk about why they became an Oro Agri retailer in 2017, what Oro Agri products bring to their dealership and how they help them compete against national distributors. ORO-HSMOC is a highly concentrated adjuvant used, in general, at half the rate of methylated seed oil (MSO) adjuvants. ORO-HSMOC can be applied with a broad range of pesticides where methylated seed oil-based adjuvants are recommended. 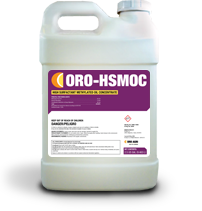 ORO-HSMOC is effective in the spreading and the penetration of foliar-applied pesticides. Prior to use, read all directions on this label and on the labels of the manufacturers’ pesticides or nutrients being used with this product. The manufacturers’ labels for specific usage and restrictions has precedence over directions for use on the ORO-HSMOC label. Conduct a jar test to confirm compatibility with the specific products to be tank mixed. Always test new tank-mix combinations before widespread use. If unsure, check with the manufacturers or contact your local State Extension Service if you have questions. To ensure thorough mixing, it is suggested that you recirculate mini tanks and bulk tanks or shake containers before using. DO NOT combine with other surfactants. Residues in tanks and spray lines, from previous chemicals sprayed, may be dissolved by ORO-HSMOC, releasing them into the mix about to be sprayed. Prior to the first use of ORO-HSMOC, pre-rinse all tanks, spray lines or containers thoroughly before adding ORO-HSMOC. Add 20 ounces of ORO-HSMOC to 20 gallons of water, circulate thoroughly for 20 minutes, and spray to waste. Due to high surfactant load, test ORO-HSMOC with post-emergent tank mix combinations prior to widespread use to minimize phytotoxicity risk. Due to the high surfactant content, DO NOT USE between V10 and VT stages on corn. FOR USE WITH PESTICIDES REGISTERED FOR AGRICULTURAL, FORESTRY, INDUSTRIAL, NON-CROP, RIGHTS OF WAY AND OTHER APPROPRIATE USES. NOTE: NOT FOR AQUATIC USE. Shake well before use. In the absence of specific mixing instructions found on the pesticide label, fill spray or mix tank 1/2 to 2/3 with water. Commence agitation and continue throughout the whole mixing and spraying process. Add pesticides and/or other tank mix components. Complete filling of tank with water. Add ORO-HSMOC last. ORO-HSMOC can be applied by ground and aerial applications. NOTE: Test stability and pH of the tank mix before adding any buffer or other adjuvants. ORO-HSMOC should be applied at a rate of 0.5 – 6 quarts per 100 gallons (0.125 – 1.5% v/v) or 0.5 – 1 pint/acre in ground, aerial, low volume or CDA applications. Use lower rates for in-season, over-the-top applications. STORAGE: Store in original tightly closed container. Store away from incompatible materials. Handle in accordance with Precautionary Statements. In the event of spillage or leakage, soak up the material with absorbent clay, sand, sawdust or other absorbent materials. Scrape up and dispose in accordance with Product Disposal. PRODUCT DISPOSAL: Collect and reclaim or dispose in sealed containers at licensed waste disposal site. Do not allow this material to drain into sewers/water supplies. Do not contaminate ponds, waterways or ditches with chemical or used container. Dispose of contents/container in accordance with local/regional/national/international regulations. CONTAINER DISPOSAL: Triple rinse container and pour rinsate into spray tank. Do not reuse container. Recycling decontaminated containers is the best option of container disposal. Dispose of contents/container in accordance with local/national regulations. The Agricultural Container Recycling Council (ACRC) operates the national recycling program. To contact your state and local ACRC recycler visit www.acrecycle.org. Follow the mixing and application instructions for the pesticide(s) or foliar nutrient(s) being tank mixed with WETCIT. With constant agitation, add WETCIT to the spray tank after all other materials are thoroughly dissolved or mixed. WETCIT will not affect the pH of the spray solution. Be aware WETCIT will dissolve any residues in the tank, lines and nozzles from previous spray materials. If these residues could cause harm to the crop being sprayed, thoroughly clean your spray system prior to mixing WETCIT in the spray tank. Use a commercial tank cleaner or mix 20 oz. of WETCIT in 20 gallons of water and thoroughly circulate through your sprayer. Dispose of the spray solution properly.